Welcome Spring! It feels so good to say that today. Celebrate with our crafts blogger Pinwheel Blog Hop. 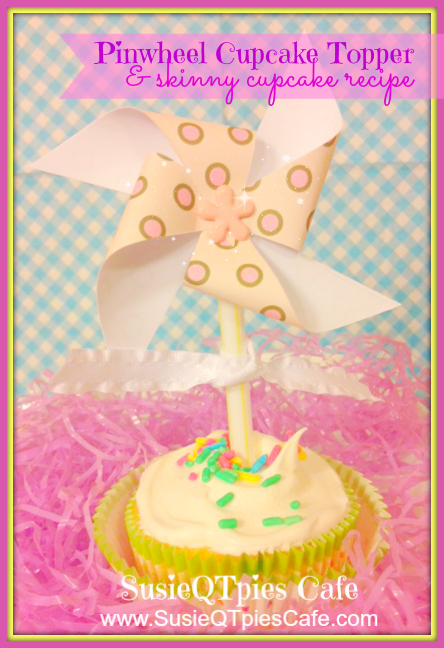 My pinwheel craft tutorial creates mini cupcake toppers for our Skinny Funfetti Cupcake recipe. Preheat oven to 350 degrees F. Line 24 cupcake tins with paper liners. In a large bowl, combine dry cake mix and Sprit. Continue to mix until the batter is smooth without lumps. Pour approximately 1/4 cup of batter into every cupcake liner. Bake 20 minutes. Let cool. When cupcakes are completely cooled, use an electric mixer to combine whipped topping and pudding until smooth. Spread over cupcakes. Makes 2 dozen. 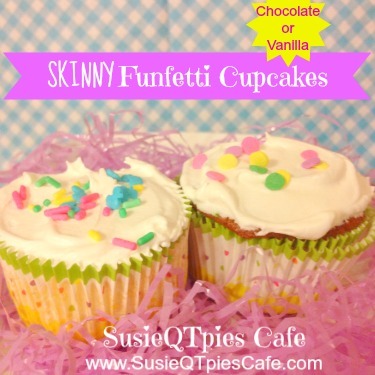 Kitchen Notes: For the Skinny Funfetti cucake - my store did not carry the Funfetti cake mix so I just used a regular white or yellow cake mix and added in 3/4 cup of sprinkles to the batter. I always make half vanilla and half chocolate. To do this, just stir in 1/2 cup cocoa powder to the cake mix after doing the first 12 cupcakes as vanilla. Frosting tip: We use different sprinkles for vanilla and chocolate. That way we can tell which ones are which. Click over to enter the Six Sisters STUFF Cookbook giveaway! You will find more tasty recipes and get the scoop on this totally DELISH cookbook. Say GOODBYE to boring cupcakes and HELLO to Spring time fun with this easy-to-make pinwheel craft cupcake topper tutorial. 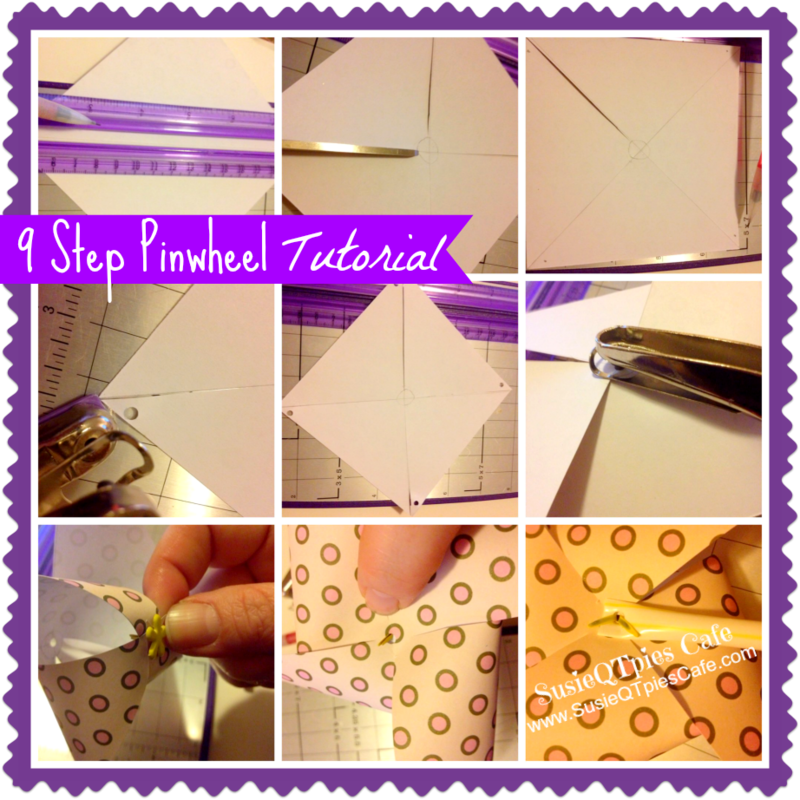 Here are 9 easy steps to create a pinwheel craft of any size. 1- Get any size square paper and draw a line from corner to corner. 2-Draw a small circle in the middle of the paper where the corner lines meet. 4-Cut up to that circle on each line. Don't cut into the circle. 5-Take a pencil and make a small dot at the bottom left of each triangle. Make your first dot, rotate the square and repeat until you have 4. 6-Use a pencil to punch a hole through each small dot or just use a tiny hole punch. 7-Use the same small punch and punch in the center of the square (right in the middle of the circle). Punch a hole in a straw tip, too. 8-Get a fastener and put through one hole at a time of the 4 corner holes. 9-Push the fastener and paper to the bottom and go through that hole. Attach the straw on the back and push the fastener through and close off. That easy! For the cupcakes I used a 3 x 3 size square. Those cupcakes look delish! Adorable pinwheels. The cupcakes look so yummy! What a great idea to add a pinwheel as a cupcake topper. I think these would be awesome for my sister-in-laws upcoming baby shower. Thanks for the recipe and the inspiration! Thank you for sharing this great tutorial and recipe! Fun-fetti is my fav! I think because it's so colorful and fun. You have great blog pics, by the way (something I'm working on). I visiting from Friday’s Linky. I hope you can stop by my blog and leave a comment and Link Up, too! Great cupcakes, what "fun"! Hope you are having a great weekend and thank you so much for sharing with Full Plate Thursday. Thank you so much for sharing this in the Crafty Showcase! We are featuring you in a Last Minute Easter Recipe Round up! !